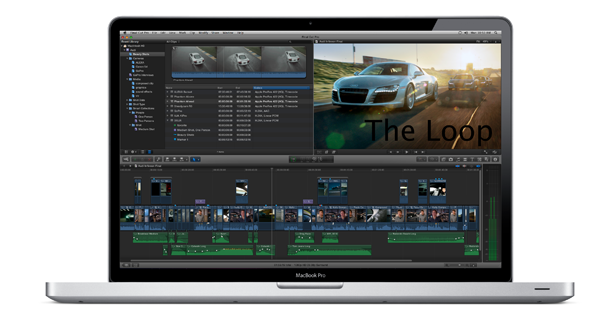 The rumors were true: Apple has previewed a revamped version of Final Cut Pro X, the company's professional video editing software for Macs. The announcement was part of a meeting during the 2011 National Association of Broadcasters Show in Las Vegas. The new Final Cut Pro X will be available in June as a standalone app for $299 from the Mac App Store, making the product more affordable on its own, rather than part of the $999 Final Cut Studio suite. Apple did not mention updates for the other apps of the Final Cut suite, but apparently the company told Jim Dalrymple of The Loop to stay tuned for more news soon. Apple said the new app has been "rebuilt from ground up," and that it will support 64-bit, allowing it to render video and effects instantly in the background - similar to iMovie, Apple's consumer-grade video editor. iMovie seems to be the source of inspiration for the look and feel of the user interface in Final Cut Pro X. The new software will also take advantage of core technologies within Mac OS X, such as Grand Central Dispatch, Cocoa, Core Animation, and Open CL. Photography Bay has liveblogged the whole preview event and has a comprehensive blow-by-blow explanation of the new features in Final Cut Pro X. Selling Final Cut Pro X as a standalone app in the Mac App Store signals the third Apple software suite to be split into separate apps since the store was launched. Apple split the iLife and iWork suites into individual apps in the Mac App Store, making buying them a la carte less expensive than a boxed product. Apple used the same strategy with Aperture, releasing its professional photography software as an $80 download, more than $100 less expensive than the boxed version.